Home // Wilderness Resort Blog // Oktoberfest is Back at the Wilderness! Oktoberfest is Back at the Wilderness! The Bavarian Burger of the Month – A perfectly grilled 1/3 pound chuck patty topped with a brat patty, Muenster cheese, onions, sauerkraut and Dusseldorf mustard served on a pretzel roll. 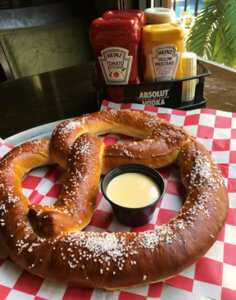 Giant Pretzel – This tasty supersized on pretzel feeds 4-6 people and is served with Dusseldorf mustard and cheese sauce. Brat–chos – Think of nachos only better. This appetizer is made with potato chippers, smothered in beer cheese, sliced smoked bratwurst, bacon and green onions. Pork Schnitzel Sandwich – We take a pork cutlet, roll it in crushed pretzels and cook it to perfection. Then we top it with Swiss cheese, sauerkraut and Dusseldorf mustard and serve it on a brioche roll. Cheesy Spatzle & Smoked Bratwurst – You’re going to love this Spatzle smothered in a five cheese sauce topped with a smoked bratwurst and served with pretzel bites. We’ll also be serving up Oktoberfest beer in a 32 oz. souvenir cup. Come for the Gemutlichkeit and stay for the delicious food. October is one of our favorite times of the year!